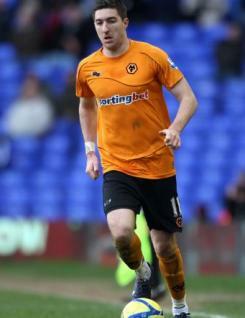 Stephen Ward is a versatile player who is one of the longest-serving squad members at Wolverhampton Wanderers, having signed from League of Ireland club Bohemians in January 2007. Originally a striker, he was switched to an unfamiliar left-wing role before reverting to the left-back position in which he now usually plays. He is quick and able to push forward down the flank. Stephen has generally been a regular in the line-up since joining the club although he missed several months in the 2009-10 campaign with a knee injury. He continued to feature in a variety of positions in 2010-11 and in a rare appearance up front at Anfield in December he scored the winner with a well-taken goal. Stephen won his first full cap for the Republic of Ireland in the Carling Nations Cup game with Northern Ireland in May 2011, scoring his side?s first goal in the 5-0 victory.